Lamborghini Huracan Spyder Performance, Engine, Ride, Handling | What Car? 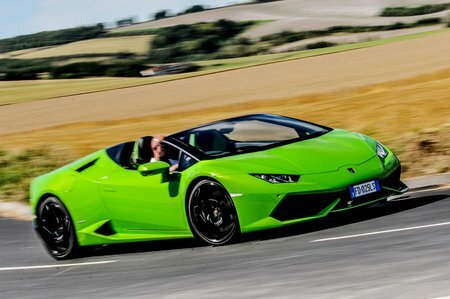 The Huracán Spyder is a fully fledged supercar. Its high-revving V10 dominates the car, pulling with real gusto from low revs and with very little inertia as it rips towards the 8500rpm redline, getting more deliriously vocal as it does. Sure, you don’t get quite the explosive (if more short-lived) hammer blow of acceleration that turbocharged rivals such as the McLaren 570S Spider are capable of, but many drivers will enjoy the still gut wrenching but more progressive delivery of its naturally aspirated V10 even more. The 631bhp Performante variant adds even more performance and aural drama that sounds as divine as it is spectacular. The seven-speed dual-clutch gearbox is meticulously well sorted, shifting smoothly and with quick-fire precision just when you want it to. It can lurch a bit when engaging a gear at low speeds, and you’ll get more satisfaction from using the steering wheel-mounted paddles in fast driving, but generally it does a near-faultless job. The rather delightfully named Anima switch allows you to toggle through drive modes and vary accelerator, exhaust, gearbox, steering weight, traction control and – if you’ve added them – optional variable dampers. Even in the most relaxed setting, the car feels appropriately sharp, but most owners will favour mid-ferocity Sport, when everything steps up a notch or two and makes the Huracán feel properly incisive. You can also add dynamic variable-ratio steering, which makes the steering respond quicker the faster you go, but we think the standard steering is more consistent and enjoyable. The problem is that the Huracán Spyder always feels a touch like it's trying to keep you safe rather than give you the no-holds-barred supercar experience that you get with the 570S Spider or Ferrari 488 Spider. Where the Huracán Spyder struggles a bit more than the coupé model is in ride comfort. We don’t think you need to add the adaptive dampers, but there is certainly a more noticeable thump and shimmy about it. The car is firmly sprung and has very little body movement, and will inevitably send big shudders through the interior over sharp-edged potholes, but it settles well enough to be usable on normal roads without being classed as uncomfortable. Don't treat the Performante model in the same light, though; it's a completely different kettle of fish. This is a car that has had its wick turned up to the max for a proper supercar experience and, as well as more power, handles with more precision and rides sublimely on all but the most obtuse roads. We simply love it.